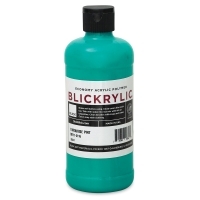 Blickrylic is a true acrylic paint, priced for the budget-minded. Because it's so affordable, you can experiment more, or try your hand at something big! Our extensive range of more than 30 rich colors, including fluorescents and metallics, makes this a very versatile paint for an unlimited range of projects. Brighten up your artwork on paper, canvas, wood, and cardboard — you can even use it on T-shirts when properly heat-set with an iron (Note: the finish may be a bit stiffer than with normal fabric paints). 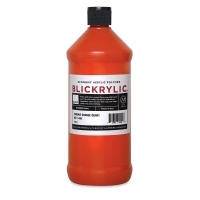 Blickrylic is extremely pourable and non-toxic, making it ideal for classroom settings. It is mixable with other brands of acrylic paint, and dries quickly to a permanent, waterproof, semi-gloss finish. Caution — Blickrylic will stain clothing if not washed out immediately. 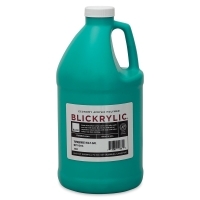 Formulated with safety in mind, Blickrylic Student Acrylic contains no latex, dairy, casein, soy, egg, gluten, peanuts, or tree nuts. It is made in the USA. 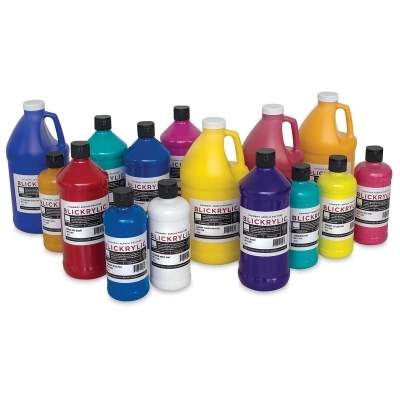 6-Pack Mixing Color Set — A convenient carry carton of 6 flip-top pints, containing Chrome Yellow, Magenta, Ultramarine Blue, Phthalo Blue, Mars Black, and Titanium White. 6-Pack Basic Color Set — A convenient carry carton of 6 flip-top pints, containing Ultramarine Blue, Chrome Yellow, Fire Red, Phthalo Green, Mars Black, and Titanium White. Lockable Pump Lids — These pump lids have an improved locking mechanism that keeps paint inside the containers, and keeps the containers clean. 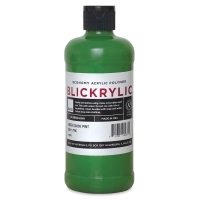 To view a PDF of Blick Student Acrylic Paints, please click here.